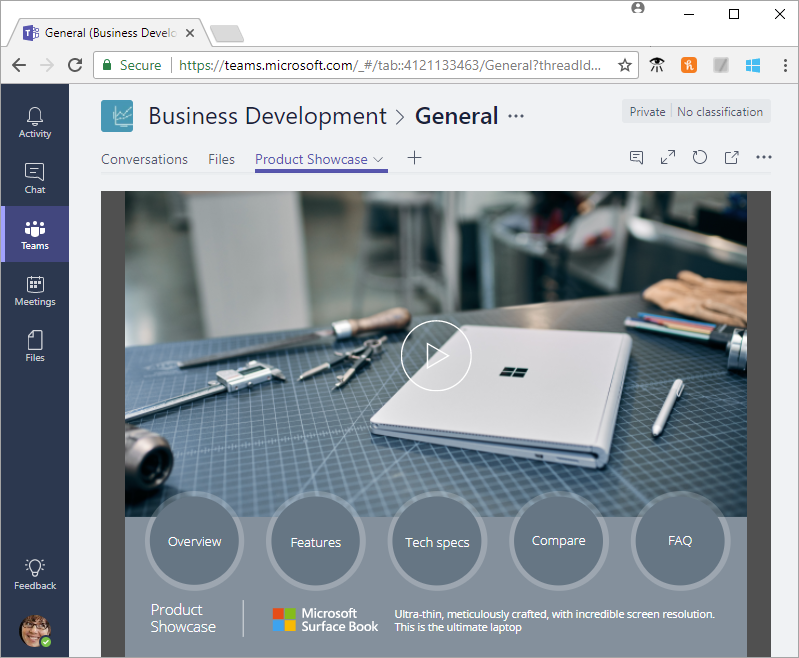 Microsoft Teams is a chat-based collaboration platform built on Office 365 technologies. You can customize the Teams experience by adding PowerApps canvas apps to your channels in Teams. 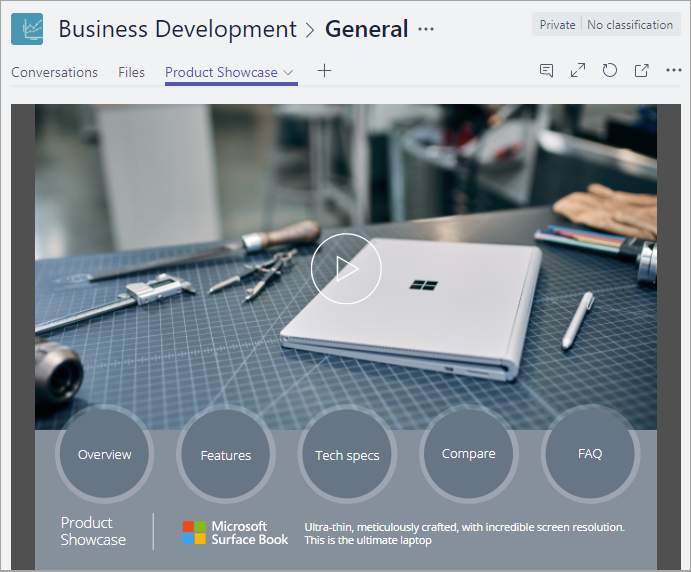 In this topic, you learn how to add the Product Showcase sample app to a Teams channel, and then open the app from that channel. If you're not signed up for PowerApps, sign up for free before you begin. To follow this procedure, you need an Office 365 subscription and a channel in Teams. Sign into PowerApps at https://web.powerapps.com. In Microsoft Teams, select a team, and a channel under that team. In this example, it's the General channel under the Business Development team. Choose + to add a tab. In the Add a tab dialog box, choose PowerApps. Choose Sample apps > Product Showcase > Save. The app is now available to use in the channel. You must share your own apps before you add them to Teams (sample apps are shared by default). In Microsoft Teams, choose the team and the channel that contains the app. Choose the Product Showcase tab. The app opens in the channel. Apps must load content such as images and .pdf files over a secure (https) connection. Not all sensors, such as Acceleration, Compass, and Location, are supported. Only these audio formats are supported: AAC, H264, OGG Vorbis, and WAV. To remove the app from the channel, choose the Product Showcase tab > Remove. In this topic, you added the Product Showcase sample app to a Teams channel, and then opened the app from that channel. 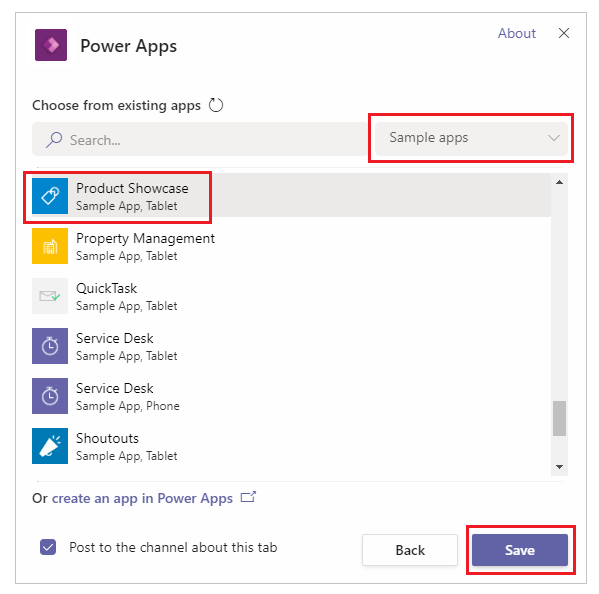 To learn more about PowerApps, continue to the PowerApps tutorials.